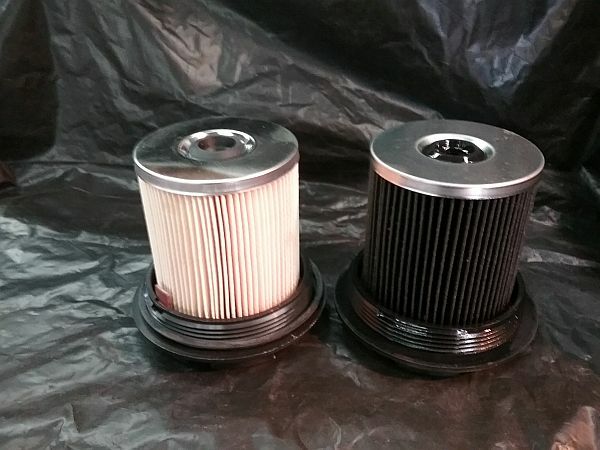 The first pic below shows my dirty used filter (6K miles) next to a new one. In December of 2017 I had all 8 injectors replaced with rebuilt ones, (plus valve cover harnesses, glow plugs and GP relay) but it looks like I must be getting oil in the fuel system. I run almost exclusively on my front fuel tank because I have an 80 gallon tank in the bed directly connected to the front truck tank. The tanks are relatively clean - but I suppose I could be getting contamination from the truck tank. I also suppose the new injectors could be leaking at the o-rings. Any suggestions - beside my below test. Dirty filter and new filter 1st pic below. 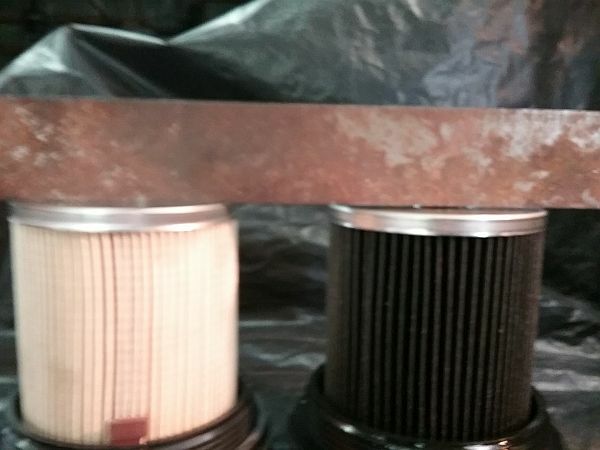 Beyond that - the dirty filter is an after market - and the pic below I used a straight edge to show the difference in the height of the New Filter from Diesel O Rings - and the dirty after market filter. There is about an 1/8" difference. However - since they are both resting upside down - on the caps - the difference might just be the thickness of the caps??? 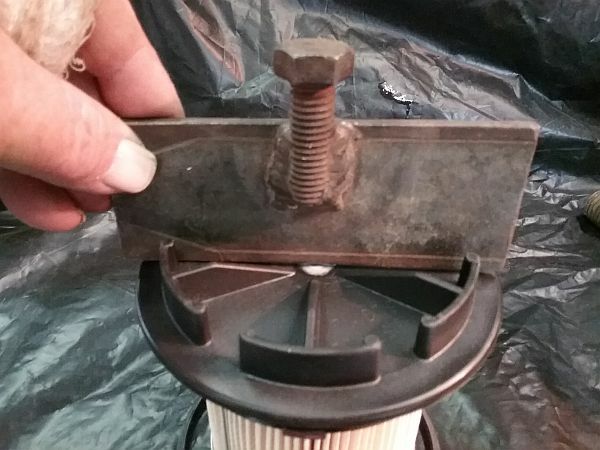 So I have installed the New Filter and will see after a few K miles how dirty it gets. The second pic below shows the straight edge across the two filters. The third pic below shows a couple of different types of installation / tightening styles on various filter caps. 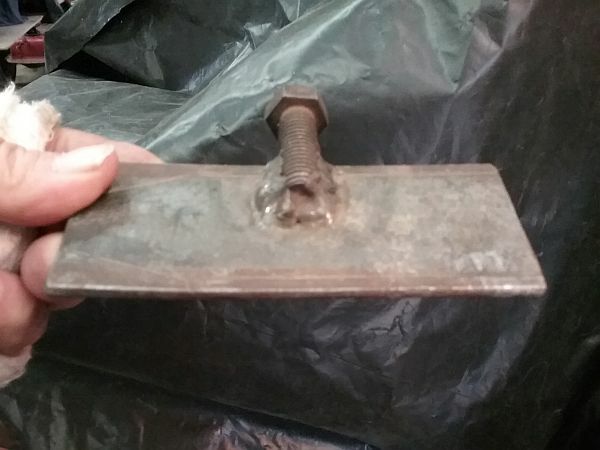 Most have the OEM style with slots with ribs - others have a "nut" made into the plastic center, and I have ran across others that have very flimsy ribs - but no slots. That's a neat filter removal tool. About the height difference of the filters: that would not make the filter oily. It's likely caused by the top housing thickness or configuration, as the measurement is comparing the bottom of an upside-down filter. In any case, if the filter material were too long to fit, it wouldn't be able to hold back the pressurized fuel in the filter bowl. How's the newest replacement filter doing? If it's still oily, I'd sample the fuel in the tanks and then look at the injector o-rings. I guess my oil could be getting "thin" by 6000 miles and bypassing injector O-ring??? Keep an eye on the oil level, when the if the 0-rings really start leaking you will see it in increase oil use pretty easy. I don’t think dirty diesel is much of a concern with the modern inspection & maintenance practices of fuel stations. other times between changes - not near as much...??? When the 0-rings really start leaking it will burn 1 qt in a few hundred miles. I keep a 50-year-old one-gallon milk bottle made of heavy glass in the back of my F250. Before I put 50 to 80 gallons in my auxiliary fuel tank in the bed of the truck from which I fuel a tractor, diesel generator and also the F250, I run a half-gallon into that old bottle prior to filling the fuel tank. I've found an occasional problem: discolored fuel that indicates too much sediment or even growing microbes; and/or a "bubble" of water settling at the bottom after a few seconds, indicating the presence of a substance that can cause unmitigated havoc with diesel equipment. Any signs of such crap stops the purchase immediately. It's a bother to sample fuel in such a way, but so is getting a tow to the mechanic to see what the damage is. I kept a similar practice down in FL after IRMA but have since discontinued the practice. 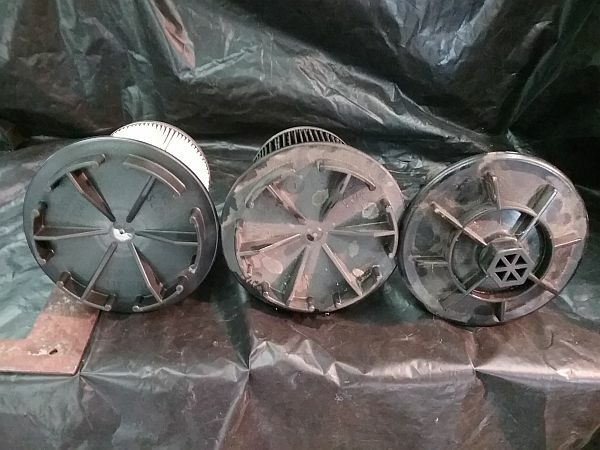 I thought black filters have always been common in the 7.3 Powerstroke? Every one I've ever taken out of mine since October 1995 and 215,000 miles have been black. As for stations keeping fuel clean- well- I recently got a flickering fuel filter light under load. I have a prefilter with a clear housing- I found about a cup of pasty brown stuff in it I suspect is microbe growth. Here is the thing- I have bought 100% of my diesel fuel from the local Sam's club for the last couple of years- I do this because they claim to put NO bio in their diesel. I have never had a black filter in 3 different 7.3 PSD just for comparison. Sounds like it might be time for some Power Service biocide treatment or maybe droppingvthe tank for inspection. Atleast your auxiliary filter has been doing its job. Not sure a slow pump means plugged up filter at the pump. Search the board here- there are MANY reporting black filters for the last 20+ years! Been dosing my tanks with BioBor JF- need to crawl under and check/dump the auxiliary filter again. Problem is I may take months to run out a tank. When you pump ALL your fuel at the same station you get pretty good at knowing the typical flow rate- when I commented on it at Sam's the attendent said "Yeah, our filters need changing- again". There is an Exxon a mile from my house that told me their pumps are often slow because their diesel filters clog often- ok thanks- I don't buy diesel there anymore if they are having that much trouble. I've stopped at stations that are so slow I give up- the local Love's truck stop gets that way occasionally- did the math one day and found it was going to take 20 minutes to fill up my 25 gallon tank on my Transit. Nope, stopped at a dollar or two and left. Last edited by AlH; 12-04-2018 at 07:15 AM. All I can tell you is I have not had a problem with black filters and many of the posts I have read here concerning black filters are the result of injector o-rings and not contaminated fuel. Most reading I have done discusses the greatly improved fuel storage and scheduled monitoring practices performed at brand name stations since 2006 when that thread you linked was created—its a cost vs benefit equation—and fuel suppliers are being more pro-active. I am certainly not questioning your own problems with bad fuel and I have never gotten diesel in SC so I will defer to your own experience. I would probably drop my tank for inspection & cleaning if I suddenly had black filters. Last edited by ArcticDriver; 12-04-2018 at 05:34 PM. I really haven't ever had problems with bad fuel until recently- not bad for 23 years and 215,000 miles. I do find it interesting that my add on pre-filter has never been black but the main filter always is. It probably is finer. My truck uses no oil that I can see so if it was injector O-rings leaking seems like it would. I've had dark filters. Wouldn't consider them black black though. Per comparison, not as dark as my oil filter. When I was doing construction, the Cummins I drove always had extremely black filters.